Pork chops are such a versatile meat which can be prepared a variety of ways. 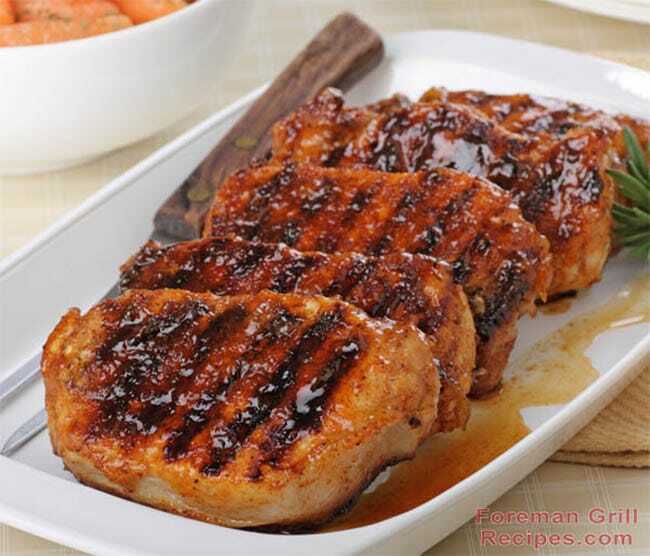 Grilling pork chops is always extremely popular and my adding the sweetness of honey, the pork chops really come alive. Using center cut boneless pork chops on your Foreman Grill or other indoor contact grill is always the best way to go. Bone-in pork chops can indeed be used, but depending on the thickness and evenness, it can often be a challenge. So stick with the center cut boneless variety for this purpose. Also, you’ll get best results by using pork chops that are thin cut. 1/4″ – 1/2″ thickness is the absolute best for your indoor grill. Any thicker and it starts to get difficult to grill properly. If all you have are thick cut pork chops, use a good knife and slice them in half. Preheat your grill for at least 5 minutes with the lid closed. Use highest setting if your grill has temperature settings. In a shallow baking dish, mix honey, soy sauce, mustard and ginger. Pour 1/2 the mixture into a separate bowl of cup for using later in the process. Place pork chops in dish and coat well with the honey glaze mixture. Place coated pork chops on grill and close lid. Grilling times will be approximately 8-11 minutes for 1/2″ thick pork chops. About 5 minutes through the grilling process you can flip the chops and turn them a 1/4 turn for crisscross grill marks if so desired. This also helps for even cooking. Remove from grill when meat has reached in internal temperature of 145 degrees fahrenheit and brush with remaining honey glaze mixture. For best results grilling pork chops on a Foreman or other indoor contact grill, use boneless pork chops that are 1/2″ – 3/4″ thick. AND this says 8-11 minutes? I’d say some people like to be safer than sorry. You should always use a meat thermometer to check the temperature.